I am a really messy person. Hey at least I'm honest. I am always on the lookout for a great stain remover. I got the opportunity to test out Purex Fels-Naptha Laundry Bar and am thrilled to say that this product delivers on it's promises. This stain treatment is so easy to use. You just wet the bar, rub the stain, wait a couple minutes, then wash your clothes as you normally would. The stains are gone. The product is so much more effective than a spray treatment. You can use this to remove dirt, grease and ring-around-the-collar as well as dozens of other stains. It is safe to use on colors. 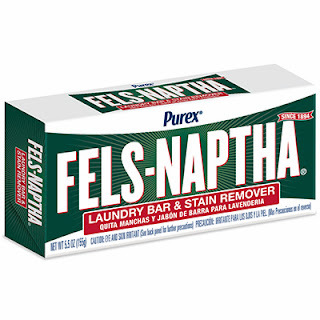 What impressed me most about this laundry bar is that it removes stains on the first try. With other stain removers you have to treat a second and sometimes third time. And they don't always remove the stain completely. There is a reason that this product has been around for over 100 years. Because it works! I am very happy to offer my wonderful readers an opportunity to try out this product for free. 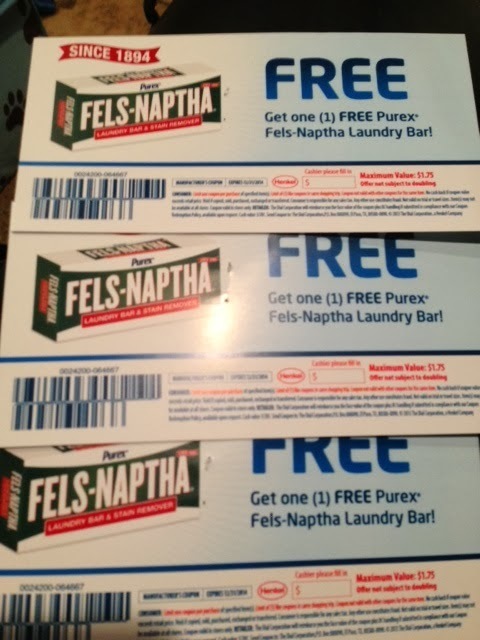 I am giving away three coupons. Good luck! This sound interesting and anything that means a cleaner wash.....I'm in!